P.S- this was reader requested post and I will be more than delighted to discuss any other trend you've been curious about. These adult version of kids onesies, seem to have taken the fashion scene by storm. 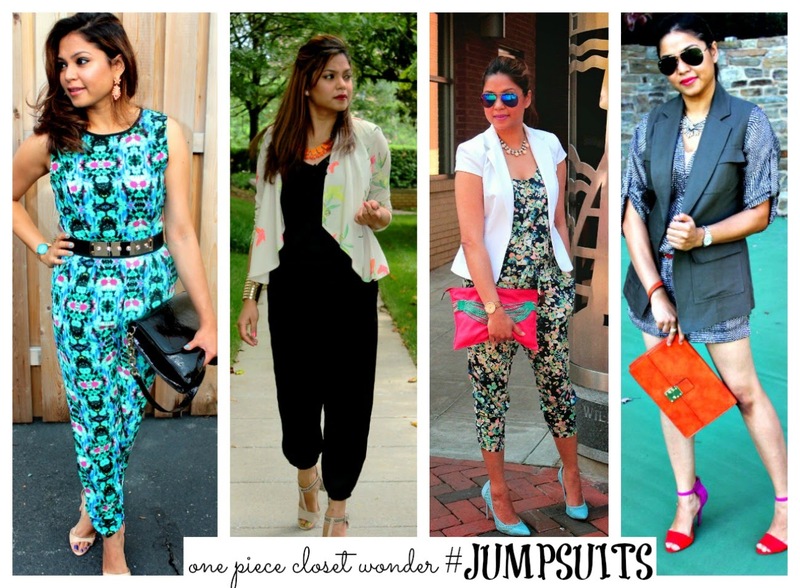 A one piece closet wonder, that needs little or no effort styling and can be easily taken from day to night. It might not be suited for the corporate world but those who work in a more casual environment, can wear it with a blazer/cardigan atop to make it more work wearable. .
As a trend-stricken blogger, I have worn these in a plethora of fit and styles and have to admit that I am addicted to this closet wonder. Continue scrolling to read the rundown, that entails not only why I wore it but also how it would work for different body types. A printed piece with a cinched waist and in an ankle length is a must-have in every closet. It is sleek, slimming, elongating and works on all body types. Stick to an all over same print that is not so over the top. When wearing a printed jumpsuit, keep the accessories minimum. A sleek chain necklace or a pair of dangly chandelier earrings, just as in my look, is all you need to pull the look together. Since the whole look is so busy, keep the shoes neutral and less fussy. LOOK #2 ( seen here ) A monochromatic (one color ) jumpsuit is not only slimming but also a game-changer for vertically challenged ladies. Look for one that has a structured waist, some feminine details like frills or lace inserts, and preferably with a narrow leg. A wide leg could be forgiving in balancing a heavy upper body. But if you are petite a full length, tapered leg outdoes any other kind in building up height. When it comes to accessorizing, options are endless with a plain palette ( your jumpsuit ). Like in the look above I am woring a neon necklace and a printed jacket to add some visual interest. Same rule applies to the shoes, wear any type, any heel height....it's still a win-win ! Shop for monochromatic jumpsuits.